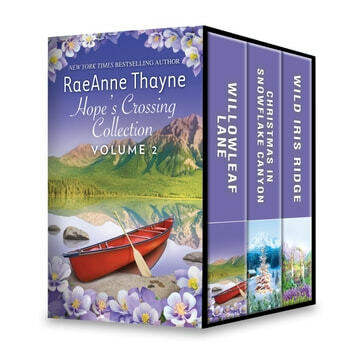 New York Times bestselling author RaeAnne Thayne’s Hope Crossing series has all the warmth and hopefulness her fans have come to love. Enjoy books 5-7 in a collection for the first time! Candy shop owner Charlotte Caine knows temptation. But willpower doesn’t come so easily when hell-raiser Spencer Gregory comes back to Hope’s Crossing, bringing with him memories of broken promises and teen angst. Now everything about Spencer’s new-and-improved lifestyle, from his mission to build a rehab facility for injured veterans to his clear devotion to his preteen daughter, Peyton, touches Charlotte’s heart. Holding on to past hurt is her only protection against falling for him—again. But if she takes the risk, will she find in Spencer a hometown heartbreaker, or the hero she’s always wanted? No one has ever felt sorry for Genevieve Beaumont. She had everything money could buy until she discovered her fiancé two-timing her. Now, she’s left with two choices: marry the philanderer to please her father or find a means to support herself. The last thing Dylan Caine needs is a spoiled socialite learning about the real world for the first time, even if she has unexpected depths. But he knows he could never be the man she needs and she knows he could never be the man she wants. So why are they hoping that a Christmas miracle will prove them both wrong? Lucy Drake and Brendan Caine have only one thing in common. And it’s likely to tear them apart. Because it was Brendan’s late wife, Jessie—and Lucy’s best friend—who’d brought them together in the first place. And since Jessie’s passing, Brendan’s been distracted by his two little ones…and the memory of an explosive kiss with Lucy years before his marriage. Now that Lucy’s back in Hope’s Crossing, she figures seeing Brendan Caine again is no big deal. After all, she’d managed to resist the handsome fire chief once before, but clearly the embers of their attraction are still smoldering….